TODAY THIS SCRIPTURE PASSAGE IS FULFILLED IN YOUR HEARING - Every Sunday this month, we have heard of a different manifestation of Jesus as Lord and King. First by the Magi from the east, then at Jesus' baptism, then his miracle at the wedding feast at Cana, and in this Sunday's Gospel(Luke 1:1-4, 4:14-21), Jesus makes it abundantly clear that the Messiah prophesied by Isaiah so long ago is indeed he (Isaiah 61:1-2). "Jesus returned to Galilee in the power of the Spirit, and news of him spread throughout the whole region. He taught in their synagogues and was praised by all. He came to Nazareth, where he had grown up, and went according to his custom into the synagogue on the sabbath day. 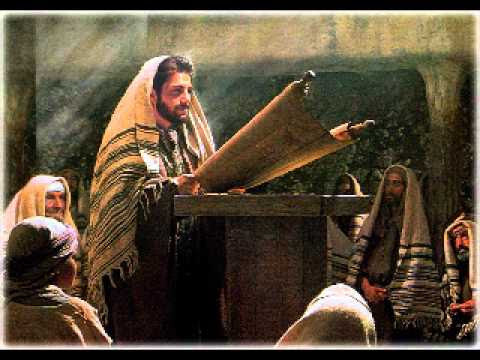 He stood up to read and was handed a scroll of the prophet Isaiah. He unrolled the scroll and found the passage where it was written: The Spirit of the Lord is upon me, because he has anointed me to bring glad tidings to the poor. He has sent me to proclaim liberty to captives and recovery of sight to the blind, to let the oppressed go free, and to proclaim a year acceptable to the Lord. Rolling up the scroll, he handed it back to the attendant and sat down, and the eyes of all in the synagogue looked intently at him. He said to them, 'Today this Scripture passage is fulfilled in your hearing.'" In our first reading (Nehemiah 8:2-4, 5-6, 8-10), we hear of Ezra who was sent to proclaim the word of God to the Jewish people as they were returning from exile in Babylon. Much like Jesus in today's Gospel, he proclaims the word of God with authority. And the people's reaction is heartfelt and passionate. "He opened the scroll so that all the people might see it - for he was standing higher up than any of the people -; and, as he opened it, all the people rose. Ezra blessed the LORD, the great God, and all the people, their hands raised high, answered, 'Amen, amen!' Then they bowed down and prostrated themselves before the LORD, their faces to the ground. Ezra read plainly from the book of the law of God, interpreting it so that all could understand what was read. "Then Nehemiah, that is, His Excellency, and Ezra the priest-scribe and the Levites who were instructing the people said to all the people: 'Today is holy to the LORD your God. Do not be sad, and do not weep'- for all the people were weeping as they heard the words of the law. He said further: 'Go, eat rich foods and drink sweet drinks, and allot portions to those who had nothing prepared; for today is holy to our LORD. Do not be saddened this day, for rejoicing in the LORD must be your strength!'" In our Epistle reading (1 Corinthians 12:12-30), Saint Paul continues his letter to the Christians in Corinth, attempting to heal their divisions and rivalries. He uses the powerful image of the body with many parts, yet united as one. Today's reading is rather lengthy, so it is truncated here, but the message is clear. "Brothers and sisters: As a body is one though it has many parts, and all the parts of the body, though many, are one body, so also Christ. For in one Spirit we were all baptized into one body, whether Jews or Greeks, slaves or free persons, and we were all given to drink of one Spirit. Now the body is not a single part, but many. You are Christ's body, and individually parts of it." There are a number of themes in today's readings but the foremost is Jesus' proclamation that he is indeed the Messiah, the Anointed One. This Gospel reading next Sunday continues this story as Jesus is rejected by the people of his own town and driven out of the temple. In many ways, our society rejects Jesus and drives him out of our temples, our institutions and our hearts. May our heartfelt and passionate response to the word of God, like those who heard Ezra proclaiming the Law, seek to reestablish Jesus as the central focus of our lives and our world.